Updated Sunday March 17, 2019 by Beth Jones. Participants should register in advance of the event online. REGISTRATION IS OPEN HERE! Registration is limited to the first 450 participants. Registration is for a specific time slot, on a first-come, first-served basis. Participants will need to complete a waiver on-site to participate. Parents are expected to remain with their players. If this event is cancelled due to weather, there is NO make up date. 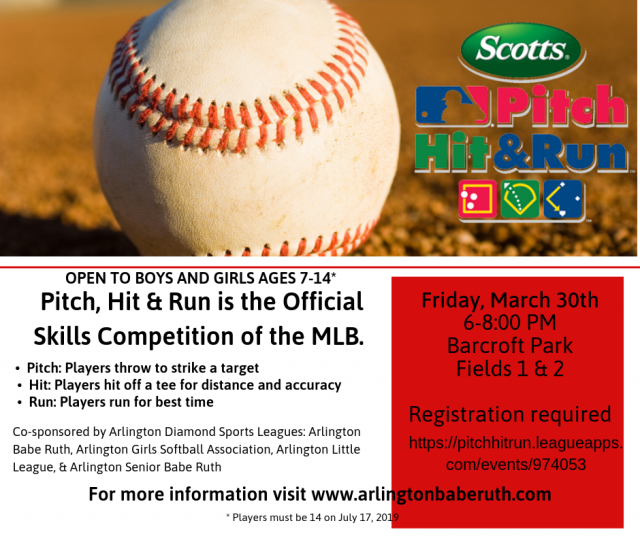 Scotts Major League Baseball PITCH HIT & RUN provides youngsters across the country an opportunity to participate in an exciting baseball/softball skills competition. This national initiative gives boys and girls, ages 7 - 14, the chance to showcase their pitching, hitting and running abilities. There are two separate divisions of PITCH HIT & RUN: baseball and softball. Participants may compete in either division. Scotts Major League Baseball PITCH HIT & RUN is intended to encourage youth participation and emphasize the “FUN” element of baseball/softball. Since there is NO registration fee, everyone has the opportunity to participate. Scotts Major League Baseball PITCH HIT & RUN tests three of the most fundamental aspects of baseball/softball - pitching, hitting and running. PITCH: Participant is tested throwing strikes to a designated “Strike Zone” target. Any method of throwing is permitted. All of the events are individually scored and converted to a total point score through the use of conversion tables. Participants will compete in each of the three components of Scotts Major League Baseball PITCH HIT & RUN and accumulate a total score based on his/her performance. a national grassroots program that has four levels of competition - Local, Sectional, Team Championship and National Finals. June in all 30 Major League Baseball markets. The culmination occurs at the NATIONAL FINALS, held during MLB ® All-Star Week. Each youngster MUST first participate at a local competition. The 1st Place All-Around, Pitching, Hitting and Running Champions in each division age group advance to the Sectional competition where scores are reset and participants compete in all three skills. At the Sectional competition, the youngster must be a 1st Place All-Around Champion in his/her division age group in order to become eligible to advance to the Team Championship. The Sectional All-Around Champions' scores are compared with the other Sectional Champions' scores in that respective MLB® team market. The Top 3 participants in each division age group advance to the Team Championship. The Sectional Champion does NOT automatically advance to the Team Championship. All participants must provide a copy of a valid birth certificate for age verification at all levels of competition. Each youngster may participate in only one division. Competing in more than one division will result in disqualification. No metal spikes are allowed during any portion of the competition. Use of metal spikes will result in the minimum score. In the event of a tie for the All-Around Champion, the youngster winning more individual events (Pitching, Hitting or Running), among those involved with the tie, will be named the All-Around Champion. If a tie still exists, the youngster with the higher Hitting score among those involved with the tie, will be named the All-Around Champion. If a tie still exists, the Running scores of those involved with the tie will be used to determine the All-Around Champion. There is no tiebreaker in the individual skill events. Scotts Major League Baseball® PITCH HIT & RUN endorses proper conduct and good sportsmanship. Major League Baseball®, LEJ Sports Group and state coordinators and organizers of the Scotts Major League Baseball® PITCH HIT & RUNTM competition reserve the right to make rulings and recommendations regarding the competition events determined to be in the best interest of the program. All rulings and recommendations are final. Participation in the Scotts Major League Baseball® PITCH HIT & RUN competition authorizes Major League Baseball® and LEJ Sports Group to use participant’s name, likeness and other personal rights for promotional use without compensation. Players must be 14 or younger on July 17, 2019. An event like this needs A LOT of volunteers! Help us make this a great event, by volunteering to help out for a short time. If we don’t get help, we won’t be able to offer these types of fun events for the players in the future. High School Students: We will be happy to sign community volunteer sheets. Just let us know that you want to help!